Jaisalmer in Rajasthan evokes a cluster of images in the minds of travelers such as a golden fort, undulating sand-dunes, intricately carved havelis and stunningly carved Jain temples. 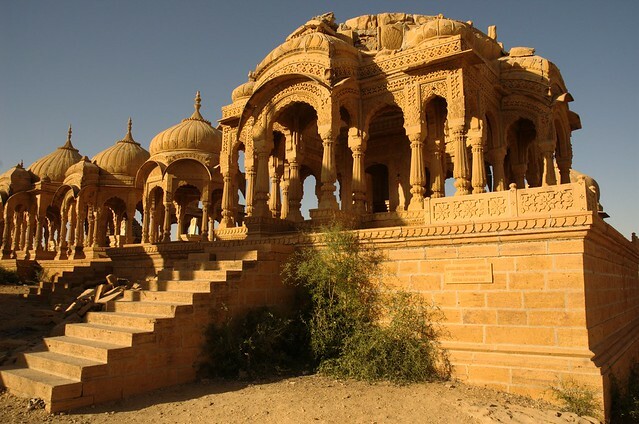 Jaisalmer is often referred to as ‘the golden city’ owing to the extensive use of yellow sandstone in the architecture of the old city which gave it a yellowish-golden tinge. One of the top tourist destinations in Rajasthan, the city draws its name from the Bhatti ruler Rawal Jaisal who founded it in 1156 AD. Owing to its strategic location on the trade route linking India to Central, Asia, Egypt, Arabia, Persia, Africa and the West, the city enjoyed long-term trade relations with these countries and flourished accordingly. 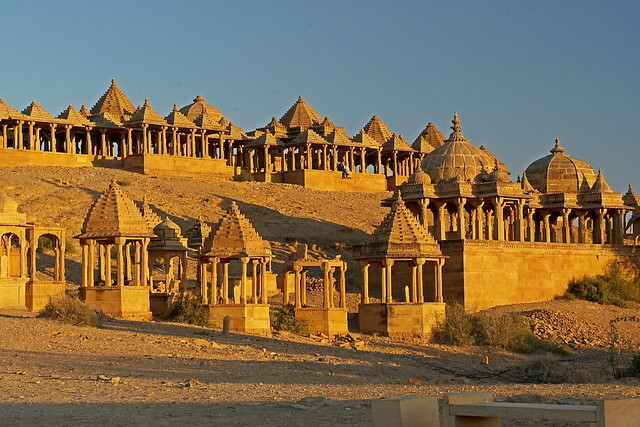 The sheer mystical charm of Jaisalmer is a feast to eyes. Various historic structures and artistic monuments scattered all around the city have retained the old-world charm that makes this desert town an important destination for tourists. Jaisalmer has a number of havelis, forts and temples sprinkled across the city and the Jaisalmer Fort shines like a burnished beacon beckoning tourists from all around the world. Besides forts and havelis, the 3-day long desert festival is a major attraction for the travelers. 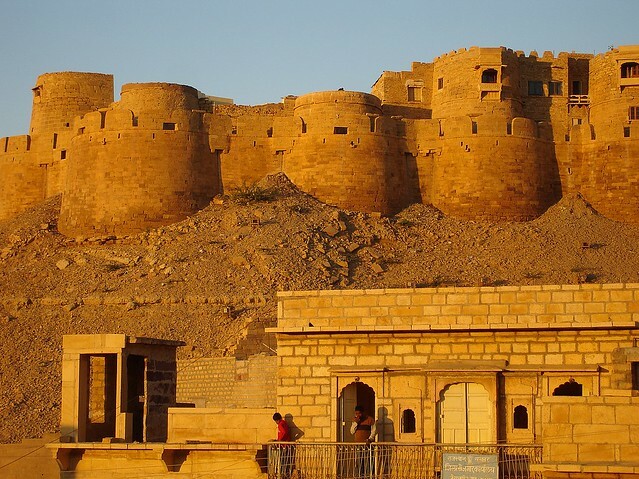 Perched atop the Trikuta hill, Jaisalmer Fort is also known as ‘Sonar Quila’ due to the abundant use of yellow sandstone which shines golden yellow in sunrise and appears honey gold during sunset. The magnificent fort consists of 99 enormous bastions and houses one-fourth of the city population. 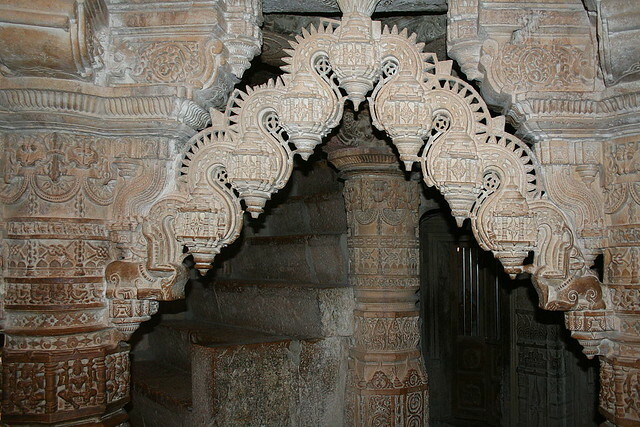 Various other structured housed within the fort includes intricately carved havelis, 7 beautifully decorated Jain temples and Lakshminath temple. The splendid havelis of Jaisalmer reveals the royalty and wealth of the affluent families of the city. Some of the most famous havelis of Jaisalmer are Patwon-ki-Haveli, Salam Singh-ki-Haveli, Nathmalji-ki-Haveli and Haveli Shreenath. Then there is this Jaisalmer Folklore Museum which contains puppets and traditional items of daily use and Desert Culture Centre and Museum which displays fossils, coins and musical instruments. Once a source of drinking water for Jaisalmer, today, Gadsisar Lake serves as a charming picnic spot for the tourists. To get to it, one has to cross an imposing gateway known as Tillon ki Prol built by a royal courtesan named Tillon. The picnic spot is also a major point for photographers to capture the Jaisalmer fort, especially in the morning, which appears golden yellow with the first rays of the sun. Camel Safari in Sam sand dunes is a must do thing in Jaisalmer. The best option is to do a 2 day safari in the undulating sand dunes with one night stay in the camp under the immense canopy of the desert sky to behold the rising sun in Jaisalmer. A camel safari in the Sam sand dunes will let you savor the magical experience of beholding the golden hue of desert sand. One of the best time to visit this jewel of desert kingdom Rajasthan is February. Jaisalmer hosts the 3-day long Desert Festival in February every year. The imposing Jaisalmer Fort serves as a backdrop for this cultural extravaganza. The festival showcases the rich and colorful Rajasthani folk culture through various cultural events such as camel races, turban tying competition, puppeteers and snake charmers. The highlight of the fest is the grand finale in Sam sand dunes with a musical performance by folk singers under the full moon sky. Winter (October to March) is the best time to visit Jaisalmer to witness the rich culture and tradition inherent in this desert jewel. As opposed to the chilly hill stations, the moderate climate of Jaisalmer come as a relief to tourists and makes them enjoy their vacations to the fullest. In summers, there is a probability that you might get affected by blazing heat.